GDP in Belarus grew by 2.4%, defying the expectations of a continuing recession. 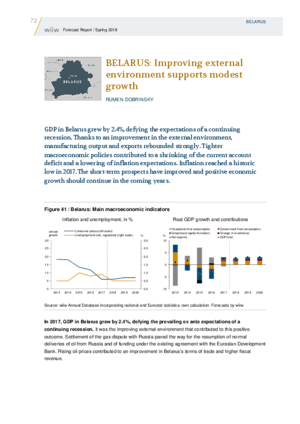 Thanks to an improvement in the external environment, manufacturing output and exports rebounded strongly. Tighter macroeconomic policies contributed to a shrinking of the current account deficit and a lowering of inflation expectations. Inflation reached a historic low in 2017. The short-term prospects have improved and positive economic growth should continue in the coming years.